Donovan tends to do things on his own terms. 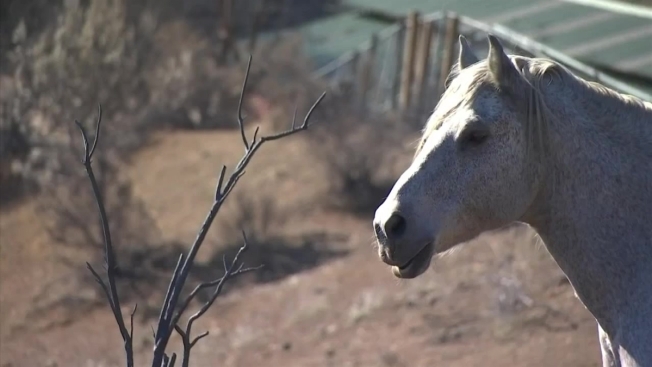 The white horse who lives on a ranch in the hills above Malibu was rescued from a rough life of mistreatment about a dozen years ago in Sacramento, which explains why he's always been leery of humans. So, it wasn't a surprise to Wendell Phillips, whose wife runs Spunky’s Rescue Ranch, that Donovan didn't budge when flames from the 98,000-acre Woolsey Fire started licking at the Decker Canyon property. The wind driven inferno advanced so quickly Friday that Phillips realized there was not enough time to round up all their rescues. "I let the horses go and opened the house up and opened the sanctuary up so everybody would have a chance," said Phillips, a retired Sacramento County Sheriff's deputy, now attorney, who brought Donovan along when the family relocated south to the ranch. In his rear view mirror, he could see the flames over-running the ranch even as he was reaching the end of his driveway. The ranch house and much of the ranch infrastructure was consumed by the fire, Phillips discovered when he was able to return a day after the firestorm. But it lifted his spirits to see that his strategy to help the animals had succeeded. He found Donovan there on the hillside in his usual spot, his white coat standing out against the charred landscape. "He's got a couple little burns on his nose and his tail's a whole lot shorter than it used to be," Phillips observed with relief that Donovan had escaped more serious harm. Donovan's favored spot had fortuitously been munched free of vegetation, giving him open space that did not burn when the fire came through. Many of the smaller animals and three of Donovan's fellow equine rescues at Spunky's had also survived, Phillips said. The other three horses quickly agreed to a trailer ride to a large animal evacuation center, but not stubborn Donovan. Phillips has put out food and water for him, and returns every day to check on him, awaiting assistance in tranquilizing Donovan to be able to transport him out of the burn zone. And there's more good news. In the wake of the destructive fire, with Sheriff's deputies patrolling the neighborhood, one who noticed the gelding told Phillips she has a friend who wants to adopt Donovan. "Going to have a happy ending" for Donovan, said Phillips. Over the weekend, Phillips provided an update that Donovan has now been transported out of the burn zone and reunited with his herd. Phillips credited the Palm Springs Police Mounted Detail Volunteers and "wrangler" Laurie Wetzler. "Without Laurie and teh PSPD Volunteers, Donovan would still be out in the cold on that burned mountain top," wrote Phillips. The Woolsey Fire has scorched some 100-thousand acres, destroyed more than 500 structures, and been implicated in Three deaths.